This cricket-themed handset comes to mark the tenth IPL edition and has the same technical specs as the regular Vivo V5 Plus, being powered by the Snapdragon 625 processor and rocking a dual camera setup for selfies. Vivo V5 Plus has been around for a while, but last week a special edition of this selfie-centric handset has been unveiled, and today it finally goes on sale. 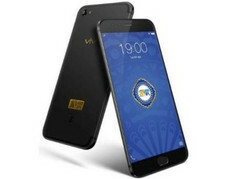 The Vivo V5 Plus Limited Edition has the same specs as the "normal" variant but targets cricket fans with the 18-carat VIVO IPL logo engraved on its back and only comes in matte black. Those who missed the launch of the original V5 Plus should know that this handset is powered by the Qualcomm Snapdragon 625 processor, next to 4 GB RAM, and 64 GB internal storage. Having a 5.5-inch full HD display, the most interesting part for selfie lovers is the front camera setup, which consists of a 20 MP + 8 MP pair. The Vivo V5 Plus Limited Edition handset can only be acquired via Flipkart and will remain exclusively available online. It carries a price tag of ₹25,990 INR - roughly $403 USD at current exchange rate.